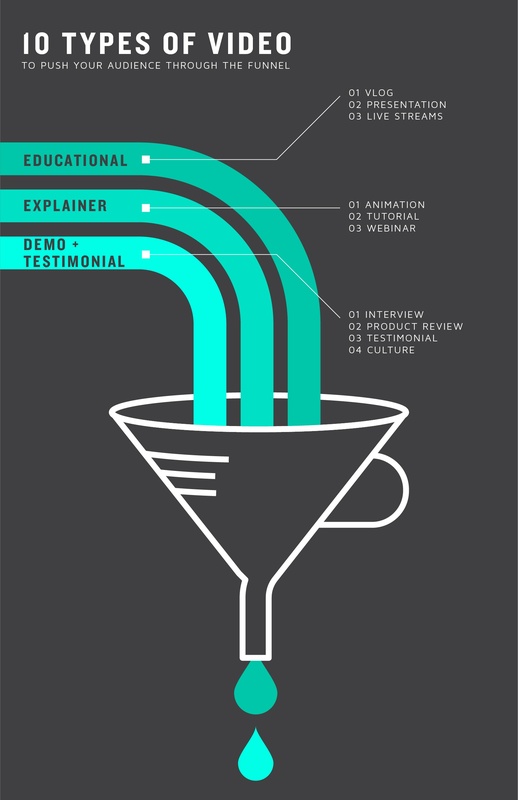 Before you can determine the video types you need as a business, we first wanted to break down the funnel into 3 simple steps: Top, Middle, and Bottom. The top of the funnel includes the 'Awareness' stage; the middle of the funnel includes the 'Evaluation' stage; and the bottom of the funnel includes the 'Purchase' stage, from a traditional sales cycle. As a potential customer moves from the top of the funnel to the bottom, they move through all the stages - awareness, evaluation, and purchase. Three to four videos per stage should empower your company to better reach, engage and convert your leads into customers. So, what are those 10 types of videos, broken down into the 3 different stages of the sales cycle? Educational videos give your potential customers a chance to learn about your product or service. This video type showcases how your product can solve their particular needs as a business, without outright promoting your solution. You want to avoid being too "sales-y" at the beginning of the sales cycle - marketers and other business professionals do not want to be sold to. But what are the educational videos that should you create? Explainer videos visually and audibly demonstrate how your product can benefit your potential customer's business, contribute to their needs and solve their problem - whew, that's an all-in-one solution right there! And it doesn't hurt that this video type is highly shareable! What explainer videos should you create? This is where your business can shine! Sharing authentic feedback from your actual customers and clients about your product or service will help convert your lead into a customer, and further expand/nurture that client-agency relationship. What demo and testimonial videos should you create? Where do you begin? Your business doesn't likely have the man (or brain) power to even begin to concept 10 video projects. You could entrust a video and visual content partner, like Pop Video! To learn more about how our partnership works, check out this page! And to see the full infographic, click here!